Time is such a treasure. and is usually what our hearts treasure the most. Many of us don’t even know what we treasure most anymore, because we feel we don’t have enough time, or, we don’t take time to discover what matters most to us. We all need to know who we are – our true identity – but that takes TIME. We all need to know that we are loved unconditionally by God – but that takes TIME. We all need to know that we are valued – not based on what we do but because we are created in the image of God – but that takes TIME. We all need healing for our wounded and broken hearts – but that takes TIME. We all need to know The One who created us – but that takes TIME. We all need to know why we were created – but that takes TIME. We all need community, connection, and fellowship with others – but that takes TIME. We all need to experience loving relationships – to love and be loved – but that takes TIME. Knowing defined as having knowledge, comprehension and understanding of the above to the degree that it affects the very core of our being, our character, our attitudes, our decisions and lifestyle choices. Knowing all of the above requires TIME with God and TIME with others. Perhaps that is why Jesus told us the greatest commandment of all was to love God and to love people as we love ourselves. LOVE will cost us TIME. Those whom we love, we will desire to spend TIME with – this is true in our relationship with God and with others. Through spending time with God in His Word, with others, and times alone in reflection, we discover the truth about God’s character, the truth about others we are in relationship with, and we ultimately discover our truest selves. That is, if we take enough time for these truths to be revealed. In order to love ourselves, and see ourselves through the Father’s eyes, we will have to be okay with spending some time alone with God in order to really receive the Father’s unconditional love for us. When the enemy of our souls isn’t successful at stealing our salvation by grace through faith, he works overtime to entrap and ensnare us with time spent on the things our hearts don’t treasure in the end at all. are gifts we should always treasure. I haven’t always been blessed with the privilege of being able to take as much time to reflect, ponder and pray, as I do now, so it is truly a treasure to me, and this makes my heart overflow with gratitude. Yes, I’ve gone through years past with the hustling and bustling about from daylight to late night where juggling responsibilities as a help mate, mom, chauffeur, ministry leader, and dance teacher amidst a household full of committed schedules and extra-curricular activities, etc. etc. were definite time hindrances to pondering on such timeless and treasured things. Today is different. This season of my life is different. Thank You, Lord. And I truly believe this is another one of those “desires of the heart” blessings that Psalm 37:4 speaks of that I am enjoying during this time in my life. As we delight in God, He begins to awaken things inside of us we never imagined were there. During my early morning meditation on some life giving truths, I purposefully turned on the sounds of the gloriously soothing voice of Christy Nockels, listening to one of her newest albums entitled, “Be Held – Lullabies for the Beloved.” As the song, “His Banner Over Me” enveloped my study space, my reflecting mind took me back to the young children I taught to dance to this song (another version) many years ago. Then, suddenly, my spirit was arrested and I followed the prompting to move from my writing desk to my comfy cushioned chair, lean back and close my eyes. “Stop. Rest. Be still.” These were the gentle whispering words I heard. With lifted arms, soaking in the Father’s presence, as a flow of heart echoing tears released down my cheeks, I could sense I was receiving more of God’s healing into this older child’s heart. This was a time to treasure the Father’s presence. and our broken hearts to the Father only occurs as we take time to be with Him. We are not just saved by God and then we are done. – that is, as we surrender our time to Him for this treasured work to be done. “Be Held” – isn’t this what our Abba Daddy desires for us to experience? Yes, the grace of being held by God like a father holds his child. Our Heavenly Father’s grace covers us and makes us feel securely loved. The arms that once graced the wooden cross are open wide still today longing to wrap His loving embrace around your heart. The Father desires to hold us all in His loving arms, if we would only come and sit in His lap – you know – open up the Psalms – play music that permeates the atmosphere with the sound of Heaven, calls you to His throne wherever you are, and reminds you that the God of all time desires to hold you and spend time with you. That’s where all the healing, peace, and joy flow – from the Father’s heart. Have you ever desired to just hold your toddler, but they were so fidgety with energy or so distracted by all the sights and sounds around them that they began to squirm, kick, and wiggle their way right out of your arms? (If you are a parent or grandparent, you get this. If not, perhaps those who are pet owners can relate to it with your puppy or kitty.) As adults, we are frequently too busy to simply sit still in the Father’s presence and “be held” – there’s either no TIME or no desire. Just as we desire to hold, comfort, and express love to our own children, so does the Father God desire to hold, comfort and pour out His love to us as His children too. Being held by God may seem like a foreign concept to you, but if more of us were experiencing the loving comfort, peace, and healing of God on a consistent basis, perhaps the TIMES we are living in would be a little less turbulent, or at least, our own hearts might be more consumed with the peace of God and faith in God through the tumultuous times we are living in. Lord, I pray for the ones I love and the ones You love to begin taking more time to be still in Your presence, to rest, to sit, to wait, to listen, and to receive all the beautiful and timeless treasures You desire to fill our days with. Thank You, Lord, for giving me TIME to just be with You and be held by You today. I know for sure that all our days and times are in Your hand, and all our best times are yet to come. Amen. we find the true treasures that last throughout all time. and the treasures of His faithful and beloved ones. Time withheld from God keeps us from being held by God. “If I could save time in a bottle, the first thing I’d like to do, is to save everyday ’til eternity passes away, just to spend them with you …” These lyrics from the touching song, Time in a Bottle, by Jim Croce are gripping. Isn’t it comforting to know that eternity does not pass away, and that the redeemed of the Lord will spend all our days with our Lord and Savior, Jesus Christ. that we may gain a heart of wisdom (Psalm 90:12) Amen. When we don’t take time to COME APART from all the demands and stresses of this life and spend time being refreshed in the presence of God, we end up COMING APART in some way physically, spiritually, emotionally or mentally. 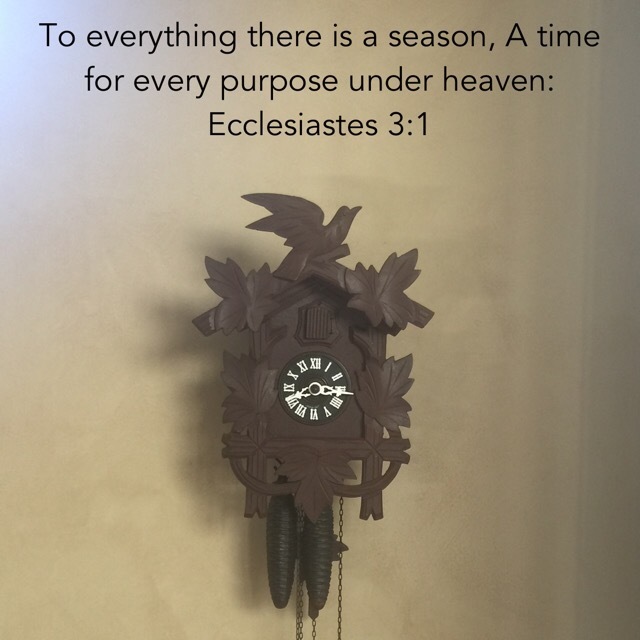 Posted in Healing Takes Time, Reflection Time, Thursday Thoughts, Time To Be Healed, Time to Be Held, Time to Love and be Loved, Time with God, Time with Others, Timeless Treasures, TREASURED TIMEBookmark the permalink.